We have an unexpected orphan lamb. I heard a young lamb crying and mama wasn't answering. I decided it had went on long enough that it needed checked out. We found the lamb, but no mama. Sheep do not tend to wander off by themselves, so it not a good sign when you can't find one among the flock. So what to do with the lamb? Being only a month old, he was still nursing and a little young for weaning. We were able to catch him and put him in a pen in the barn. He would be super stressed being by himself, so we put an older lamb with him that was pretty tame. I have never had a lamb that needed to be started on a bottle at a month old, I didn't know how it would go. Surprisingly, he took to the bottle pretty quick, after just a few attempts. Being with the other lamb helped tremendously, after a couple days he was drinking bottles and eating grain. He went from the pen to the barnyard and once we knew he would approach us for a bottle, he was put back in the pasture with the other sheep. He is doing well. 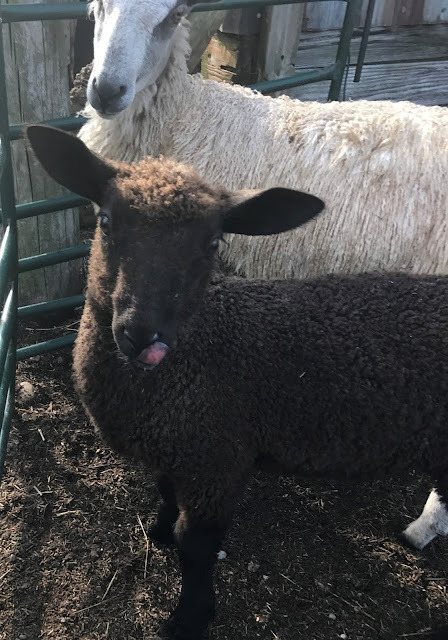 Thankfully, it is a rare occurrence to get an orphan lamb. He's looking good, and I love the brown fleece. I'm sorry about your losing the sheep. That must be one of the harder aspects of what you do. I'm so glad to hear that you were able to save the lamb and get it to start taking a bottle.